ARISTON, CRESCENTIAN, EUTYCHIAN, URBAN, VITALIS, JUSTUS, FELICISSIMUS, FELIX, MARCIA, and SYMPHOROSA Martyrs of Campania, a group of Christians martyred in the Campagna (circa 285) early in the reign of Diocletian. Aside from their names, no further information on their lives is extant. ACESTES, LONGINUS, and MEGISTUS (Martyred Soldiers of Rome), (First Century), according to long-established custom SS. Acestes, Longinus, and Megistus were the three soldiers who led St. Paul (29th June) to execution in Rome. Converted by St. Paul, they were beheaded shortly afterwards. Nothing further is known of these saints. MONEGUNDIS, a young woman in Chartres who, following the repose of her two daughters in childhood, with her husband’s consent, became a hermitess. In his writings St. Gregory of Tours (17th November) called her a saint. 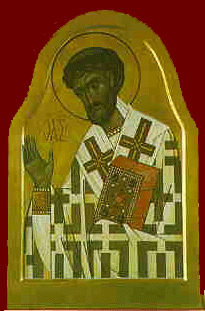 St. Monegundis reposed in 570. OUDACEUS (EDDOGWY), the son of Breton prince Budic, who during exile in Britain married the sister of St. Teio (9th February). Soon after his exile ended, St. Oudaceus was born, and Budic dedicated to God in thanksgiving for his repatriation. Budic sent him to be educated by his uncle, St. Teio, at his monastery at Llandeilo Fawr. Even as a youth, St. Oudaceus was renowned for his piety and virtue. As his repose neared, St. Teio selected his nephew to succeed him in the See of Llandaff; and upon the repose of St. Teio, St. Oudaceus became the third Bishop of Llandaff. His episcopate was distinguished by love towards those in need, encouragement of the penitent and a firm stance against all wickedness. The date of St. Oudaceus repose is variously dated from circa 564 to circa 615, however the majority of sources list 615. PROCESSUS and MARTINIAN, (Date Unknown), two gaolers of SS. Peter (29th June) and Paul (29th June) in Rome. Converted by the Apostles during their imprisonment, SS. Processus and Martinian were later martyred during one of Nero’s persecutions of Christians. Their relics are enshrined at St. Peter's Basilica in Rome. and for thy manifold virtues thou hast received a crown on high. that he save those who honour thy memory with love. SWITHUN (SWITHIN), Little is known of St. Swithun’s life, aside from the fact that he was consecrated Bishop of Winchester in 852. According to pious legend, St. Swithun was born in Wessex England and spent his youth at the monastery in Winchester. As bishop, he was renowned for his meekness and humility; making pastoral visits barefoot, for example, and for his diligent work bringing sinners to Christ. St. Swithun’s legacy of humility carried on after his repose in 862, when, at his request, he was buried in the cemetery outside the minster. According to twelfth century English historian William of Malmesbury, St. Swithun chose this site so that it would be subject to the feet of passers-by and to the raindrops pouring from on high. In 971, when his relics were being translated to a shrine which St. Ethelwold (1st August) had had built for them, a torrential rainfall either delayed or hindered the ceremony, giving rise to the popular superstition regarding rain on St. Swithun’s Day.